The days are getting longer; the sun is slowly melting the snow. Soon, buds will emerge to make room for flowers and leafy trees. Spring has arrived! This means it’s time to rejuvenate, adopt a healthy lifestyle, or if you prefer, replenish energy. And hey, isn’t that the primary goal of yoga? Being a yoga practitioner myself, the spring season is the perfect moment to combine the physical well-being and relaxation of the mind. The fact is that we are pampered in Outaouais since the region has amazing places for lovers of this discipline ... even those on the go! So here are peaceful rural centers for yogis from here and elsewhere. How about an escape on a 500-acre forest reserve? Very inspiring, isn’t it? The magnificent Birla Center offers you the opportunity to do so during a relaxing holiday. This retreat center welcomes people from all over the world who come to enjoy various classes and services, such as palmistry, astrology, Ayurveda treatments, massage and, of course, yoga. The Birla Center presents a holistic approach of yoga. Much attention is given to compassion, channeling energy and liberating breathing. Your mind and body will then become one. You may join the weekly session to reduce stress or drop-by to continue your yoga routine. In the summer, spend the morning doing a few Sun Salutations on the private beach! You’re spending a weekend at the Center? Sleep in the handcrafted log chalet on a private beach (with spectacular views of Lake Dumouchel and the surrounding hills), take a hike in the wooded trails, relax with a massage, meditate in specially dedicated areas, bring out your creative energy in the labyrinths of stone and turf and complete your yoga session with a moment in the infrared sauna. Having visited the Birla Center myself, I must admit that upon our arrival, we feel the positive, warm and calming energy of the staff. So this is the perfect place to relax and get a fresh start. Peaceful haven of relaxation nestled on the edge of Gatineau Park, La Grange is a real gem in terms of yoga studios. Just imagine: you take the position of Warrior 1 ... your gaze is directed at the ceiling, which is decorated with majestic wooden beams from an old barn ... you inhale … then turn while transitioning into Warrior 2. That 's when you cross a breathtaking view of the surrounding mountains. Well, it's not just your imagination, since this scenario is a typical yoga session at this rustic loft in Wakefield. There is something for all tastes and all levels! Hatha Yoga, Svaroopa Yoga, restorative yoga, prenatal yoga, Yin/Yang Yoga, mom and baby yoga, and so on. More than a dozen variances are offered. Tai Chi, Pilates, dance and meditation are also on the menu. The courses are designed so that you can "drop-in " or attend on a regular basis. Practicing yoga in this picturesque place can become the icing on the cake of a stay in the area since La Grange is a beautiful B&B. So, take some time to explore the trails, or wander in the village of Wakefield to discover its artists' studios, boutiques and cafes. After dinner, you can warm up by the living room fireplace or the garden`s campfire. 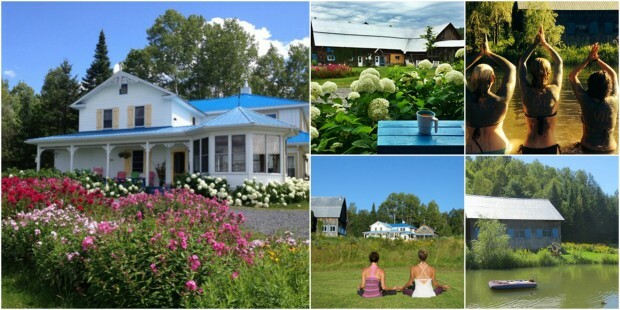 Located in the heart of La Petite-Nation La Lièvre, Centre de vie is a place dedicated to rest and nature. Surrounded by 108 acres of nature, a pretty little lake, trails, woods and fields, you will breathe life, calm and peace. In fact, the Centre aims to be a place for personal growth, even transformative, where you take control of your health. Juice cleanses, naturopathy, iridology, and massage services are offered, in addition to Pilates, harmonization of the chakras and yoga. Oh! Did I mention the hot tub, sauna, bathing lake, the charming rest area, the fire area, the cozy lounge with fireplace and the delicious vegetarian food? Yoga enthusiasts, you can attend one of the three weekly classes (even for a one-time only): Yoga Flow, Hatha Yoga, Yoga of integral learning - which is based on physical exercises for awakening the body and mediation for self-enlightenment. Or, make the most out of a rejuvenating trip by including yoga during your solo, couple or group retreat! Whether you are a hotel guest or not, the Wakefield Mill offers a great range of opportunities to refocus your energy. On Saturdays and Sundays, enjoy an hour of Hatha Yoga; a more exploratory and inclusive form of yoga, thus both energizing and relaxing. The course is held at Studio Yoga MacLaren, within the MacLaren House built in 1861. Accommodating up to 9 people, the historical and serene charm blends perfectly with the type of yoga practiced. If you want to include this kind of rejuvenating activity to your stay, I recommend opting for one of the Mill’s relaxing packages: Euphoria. Release all your bodily tensions during a Swedish massage, free your mind during an hour of yoga, then enjoy a lunch at the Heron restaurant while admiring the scenic views and gurgling sounds of the La Pêche river waterfalls. A truly serene way to start your day. This summer, take advantage of the beautiful weather to spice up your yoga: during the sunset at the Aylmer Marina, on a paddle board at Village Majopial or on Parliament Hill on the other side of the river. There’s no reason to slow down during your holidays ... au contraire. 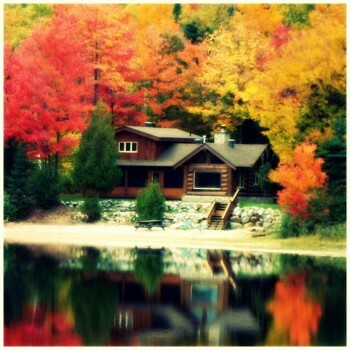 For more #outaouaisfun activities, visit our website at www.outaouaistourism.com! And follow us on Twitter, Facebook and Instagram … remember our hashtag, #outaouaisfun. The 2015 “People’s Choice Award” contest is now officially open, with more than $6,000 in prizes to be won! From now to April 10, VOTE for your favourite regional tourist attractions!